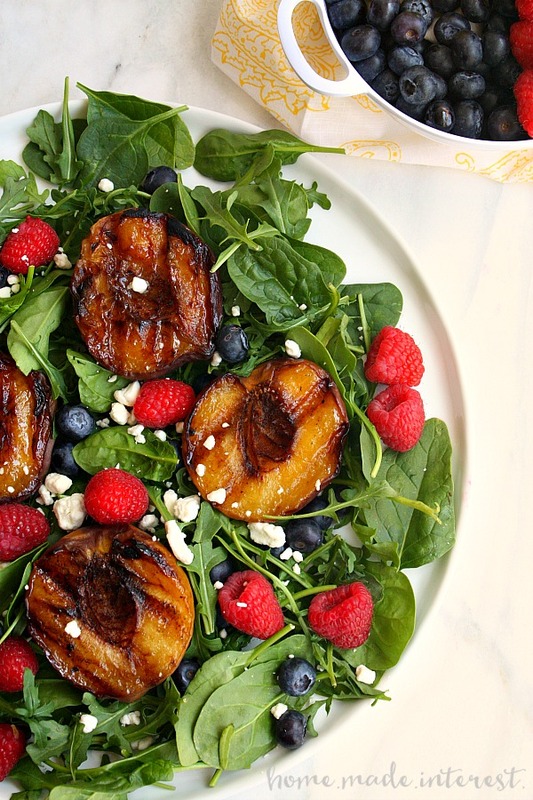 Grilled Peach and Berry Summer Salad - Home. Made. Interest. We’re happy to be teaming up with Earthbound Farm today to bring you this beautiful and delicious organic summer salad! 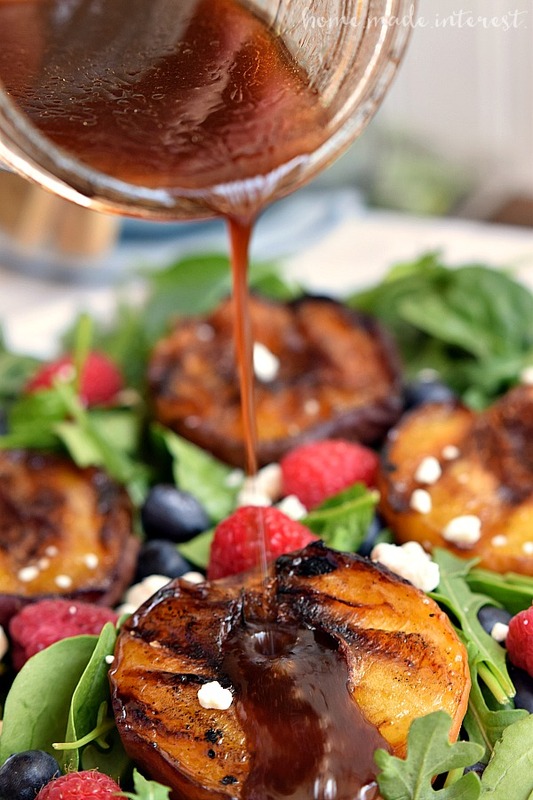 Grilled Peach and Berry Summer Salad summer salad made with fresh summer fruits and a sweet balsamic dressing. Alright, we are definitely officially into Spring here in Maryland. We’ve had a week straight of nice weather and this past weekend was absolutely beautiful. I love this time of year. It isn’t too hot and humid yet, the days are getting longer, and I’m firing up my grill every night for dinner! I’m not kidding guys, I cook on the grill all through the summer and into the fall. I love the taste of grilled meats, vegetables, and even fruits. It’s also a great way to save energy during the warm months because you don’t heat up your house using the oven and the stove. That means the air conditioning runs less. Look at that, you can do your part for the environment AND make great tasting food all at once! Speaking of great tasting food today’s amazing Grilled Peach and Berry Summer Salad is made with all organic fruits, berries, and greens, and I think it makes all the difference in the flavor. 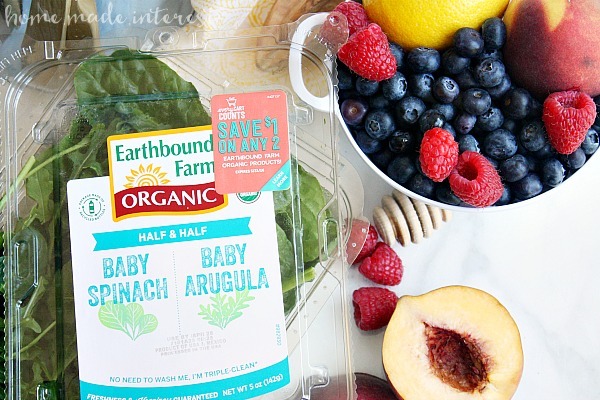 I switched to buying organic fruits and vegetables when I had my first kid. There is something about becoming a mom that makes you start thinking about how you can make a difference environmentally and buying organic is a simple place to start. We’ve got to take care of this world so it will be around for our grandkids’, grandkids’, grandkids. Right? This simple salad is made with fresh peaches sliced in half and brushed with a little butter. 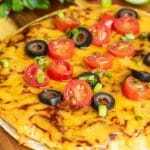 You just place them on the grill and cook them until they are slightly charred and they begin to soften, about 4-5 minutes per side. 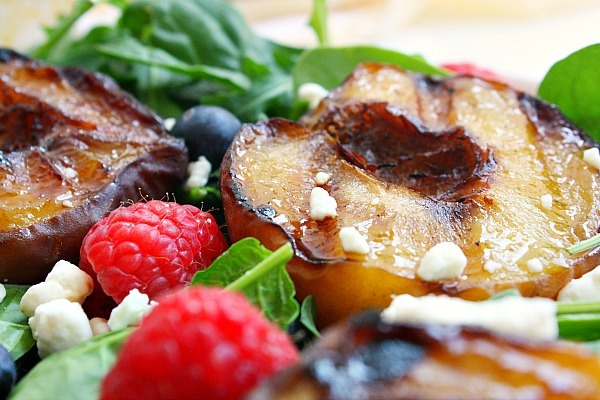 When the peaches are ready they are nestled onto a bed of greens along with fresh blue berries, raspberries, and a little crumbled goat cheese. I use Earthbound Farm organic greens for all of my salads. 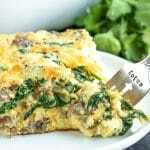 They have so many different products to choose from but for this recipe I really like their Earthbound Farm 1/2 & 1/2 Baby Spinach & Baby Arugula mix. The arugula gives the salad a little peppery bite that goes great with the sweetness of the fruit. I choose Earthbound Farm products because they work so hard to keep our planet happy using sustainable farming practices. Earthbound Farm is certified USDA organic. That means they don’t use any chemical herbicides, fumigants or synthetic fertilizers, and no unapproved pesticides on soil or products. All of that gives me peace of mind when I’m feeding my family. To bring out the flavors of all of those fruits and veggies I make my own Sweet Balsamic dressing. 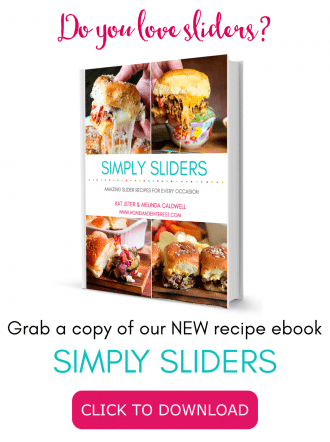 It’s quick and easy I just add balsamic vinegar, a little raspberry jelly (seedless preferably! 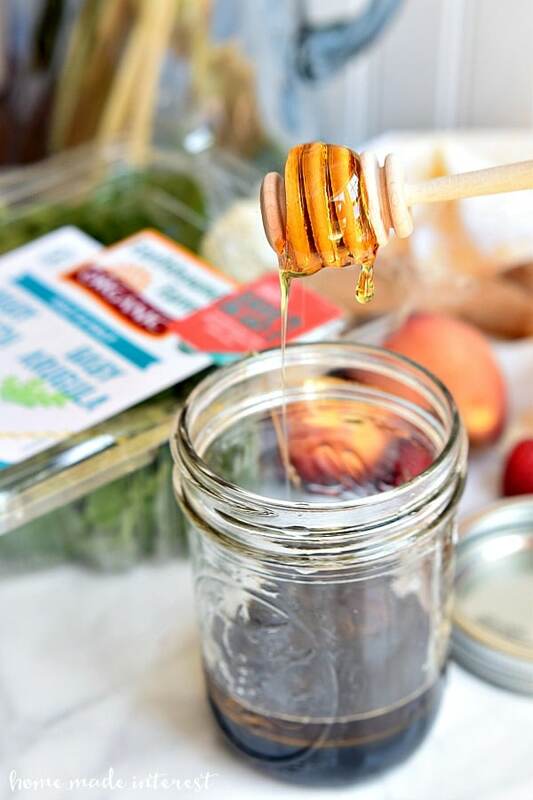 ), honey, lemon juice, olive oil, and a little salt, to a mason jar, screw on the lid and shake. 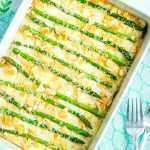 Instant dressing and the best part is there is no waste. When I’m done with my dressing I can wash out the jar and fill it with my next creation. Keeping the earth happy is all about the little things that we do each day that can add up to make an earth friendly big impact. Want an easy way to do your part for the environment? Visit Everycartcounts.com and take a short quiz. For every quiz taken (up to 20,000) Earthbound Farm will plant a tree! You’ll also receive a coupon for $1 off any Earthbound Product at the end of each quiz taken. What are you waiting for?! 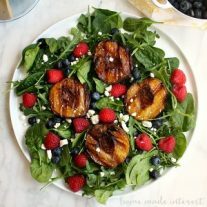 Grilled peaches, fresh berries, crumbled goat cheese, and organic spinach and arugula topped with a tangy balsamic dressing makes a healthy summer salad. Brush peach halves with butter on all sides and then place face down the grill. Cook over medium high heat for 4 to 5 minutes per side or until fruit begins to soften. While the peaches cook add all of the sweet balsamic dressing ingredients to a mason jar, fasten the lid and shake it until it is mixed. Once the peaches are ready add them to the greens along with the raspberries,, blueberries, and goat cheese. 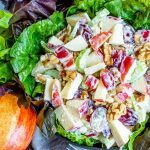 Pour the sweet balsamic dressing over the salad and enjoy! 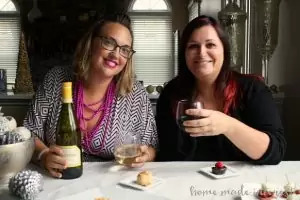 This is a sponsored post written by me on behalf of Earthbound Farm. Stop it, this looks SO good! I can’t wait until peach season!! !